At PigCHAMP, we are committed to providing our customers with the tools, resources and support necessary to be successful using our products. Each month, we will send you an e-newsletter full of tips and tricks, product information and industry news. As always, we like to hear from you! If you have any questions, comments or concerns, please email us or phone us: 1-866-774-4242. It's important to regularly back up your PigCHAMP data to an external device. In the event of a computer failure or crash, having a recent backup will allow you to quickly and easily restore your information. 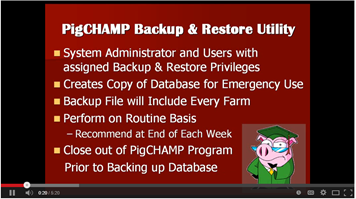 Instructions on how to back up your PigCHAMP data can be found in the FAQ section of our website or watch this video. In this month's "Did You Know", we talked about how to back up and restore your data. Among the innovative features of the PigCHAMP Online product is the automatic back up of your data on a remote server - which means your data is always safe from a computer crash.